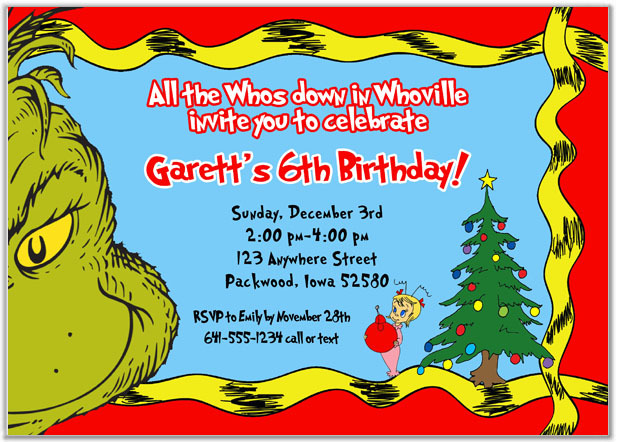 These colorful Dr. Seuss Grinch Who Stole Christmas Party Invitations can be personalized however you would like. They can be made for a birthday, Christmas party, etc. Size: Approx. 5 x 7"
Paper Weight: Professional 80lb. white card stock, matte finish. Proofs via email: REQUIRED. Invitation proofs are normally emailed within 24-48 hours of receiving payment and personalization information. From time to time our workload is busier than normal. Please click here to check current turn around time.